Learning in a beautiful place! CNPS Rare Plant Survey Protocols workshop, Point Mugu State Park, March 2016. The CNPS Education Program is wrapping up a fantastic spring-summer season of workshops through the Plant Science Training Program. We have held seven workshops this year around California, training 120 individuals on vegetation monitoring and mapping, introductory plant family identification, and rare and wetland plant identification and assessment skills. Many workshop participants attend on behalf of their organizations, planning to bring their new skills back home to help other coworkers or volunteers become proficient in these science-backed techniques and resources, spreading the reach of this program even further to help ensure a healthy future for California’s native plants and special places. In keeping with the traditions of this training program, locations for our core workshops are varied each year to make them more accessible to those around the state. We like to choose field sites that are particularly interesting or attractive botanically, so participants get the most education (and enjoyment!) out of their experience. Some location highlights this year have included classes in the Mojave Desert, the White Mountains, and CNPS’s birthplace, the Regional Parks Botanic Garden in Berkeley. Sampling using nested quadrats. 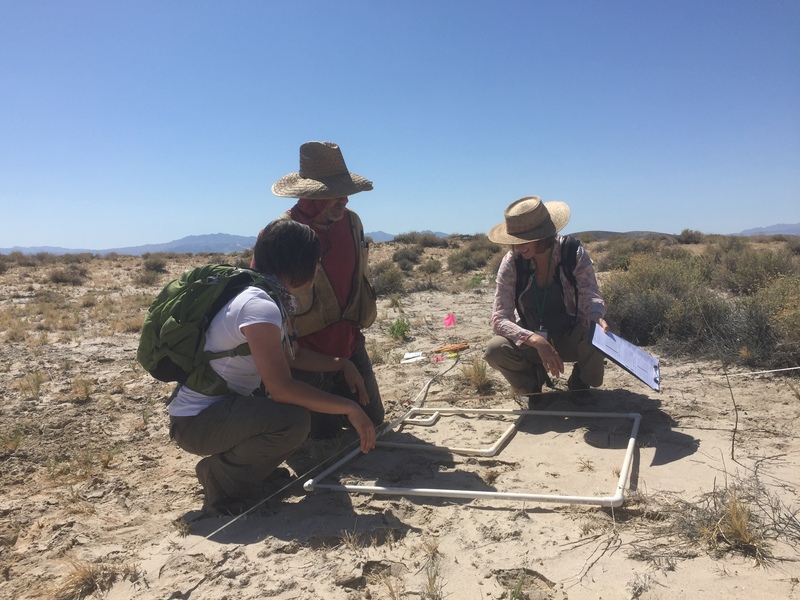 CNPS Measuring & Monitoring workshop, Mojave National Preserve, May 2016. CNPS workshops support California’s native plants in many ways. Educating attendees on sound scientific techniques and resources ensures that California’s plants are being treated and accounted for properly by those collecting and utilizing data – whether they are consultants, agency staff, land managers, scientific researchers, or advocates – so that the plants and their habitats can continue to be properly managed and protected. These workshops not only provide necessary education around the state, they often produce valuable results beyond the knowledge imparted to attendees. This March, the Rare Plant Survey Protocols workshop visited Point Mugu State Park and assessed a population of small-flowered morning glory (Convolvulus simulans), a California Rare Plant Rank 4 species, collecting data which were contributed to the California Department of Fish and Wildlife’s California Natural Diversity Database (CNDDB). In July, the Vegetation Rapid Assessment/Relevé workshop conducted field surveys high in the bristlecone pine (Pinus longaeva) forest above 10,000 feet in the White Mountains, adding the first survey data points in this area to the CNPS Vegetation Program’s rapid assessment database. Other CNPS workshops also regularly complete “practice” surveys and reporting forms in which real data are collected and submitted to other scientific resources, so that they can be utilized throughout California. CNPS’s training workshops have spread knowledge and information to countless numbers of individuals over the past 10 years that this program has been in place, and in the next 3-5 years, we are anticipating offering even more workshops around California in conjunction with the new California Consulting Botanist Certification Program. The more people we can educate on sound science and information, the better protected our native plants will be! We are developing our 2017 training schedule now, which will be posted soon at www.cnps.org/workshops – so stay tuned for another spectacular year! Sponsored by the California Department of Water Resources, CNPS is pleased to announce free residential landscape conversion workshops for homeowners. No experience required! Anyone with an interest in replacing water-thirsty lawns with beautiful native plant landscaping are encouraged to attend. Workshops will be held in Modesto, Chico, Redding, and Sacramento this July and fall, with the first classes in Modesto and Sacramento coming up July 18 and 19th, respectively. For more information, to view the dates, or to register, click here. Classes are limited to 50 attendees, so be sure to sign up in advance. Southern California homeowners, we haven’t forgotten about you either! A two day “Ditch Your Lawn” workshop will be held October 29-30 in partnership with Southern California Garden Clubs in Encino. There is a fee for this class, but CNPS and SCGC members receive discounted registrations. Click here to learn more about the Encino “Ditch Your Lawn” workshop, or to register today! I joined chapter delegates from all over California and into Baja – we met at the Rancho Santa Ana Botanic Garden and the meeting was fascinating. The diversity of issues combined with passion was inspiring. The picture above is of César Garcia, president of the Baja chapter, with Lesley and Bill Hunt who represent the East Bay chapter in a variety of important functions. 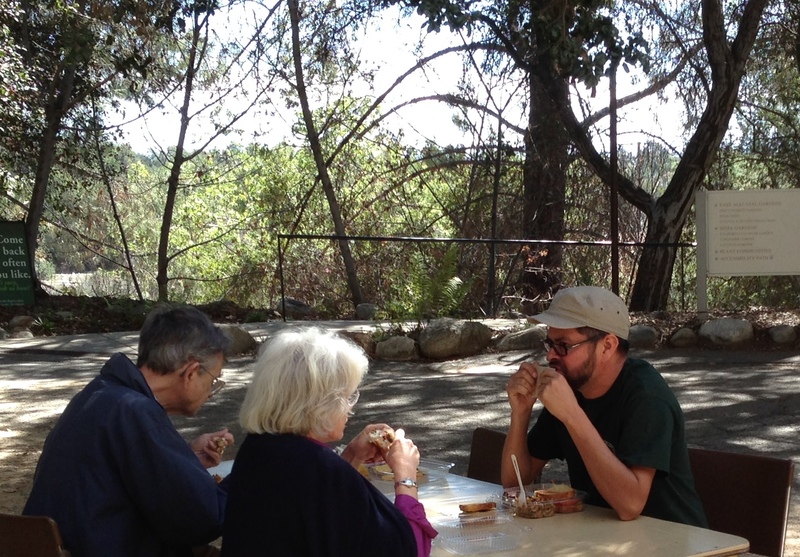 We sat outside for meals, and for the breakout sessions. I ran one on horticulture, of course, and we found some very interesting information: chapters are connected in varying ways and at varying levels with other organizations, water authorities and political leaders. Over time, we will coordinate efforts to improve our presence in the larger local context. We will also work on a smooth flow of information between chapters, and with the organization staff. Pesticide use in nurseries was another topic that will take some work – we need data in order to work with nurseries and towers to remove harmful materials from their inventories. And, finally, our message is being honed to clearly present our point of view, and so that we can deliver it with clarity to differing audiences.